Cordless vacuums are nice because they are convenient and you don’t have to worry about finding a different plug every time you go into a different room. But one of the main downfalls of cordless vacuums in general is the poor battery life. That concern is the thing of the past when you get your hands on the Dirt Devil Accucharge 15.6V Cordless Bagless Stick Vacuum, BD20035RED. Dirt Devil’s Accucharge technology claims to give your vacuum a charge twice as fast as normal and use up to 70% less energy, meaning your battery will last a lot longer. Nothing is more frustrating than vacuuming a room, only to lose power in the middle of it. You won’t have to worry about that anymore when you have this handy Dirt Devil vacuum. The Accucharge Technology is by far the highlight of the Dirt Devil Accucharge 15.6V Cordless Bagless Stick Vacuum, BD20035RED. The technology will actually protect the battery in the vacuum by monitoring the unit until it is fully charged. Once it is completely charged, then it will convert into a trickle charge, so that it maintains the charge without overloading the battery. The result is a longer-lasting battery that will stay healthy for a longer period of time. The motorized brush cleans the carpets well, but it is also nice to be able to turn that feature off to be able to clean hardwood floors safely. With just a push of a button, you can clean different types of surfaces with ease. And the vacuum is light enough to be able to move between different surfaces and rooms without much strain on your body. Even though this vacuum has pretty good power, it is mainly supposed to be used for light cleaning. Many people have complained that the power decreased drastically after a year or so of use. But those people also used it quite frequently. Still, people rightfully expect a vacuum cleaner to last a little longer than a few months to a year. With power also comes a lot of noise. Hardwood floors generally cause vacuums to be noisier to begin with, and this one is no exception. 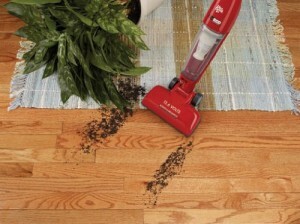 If you want a hardwood floor vacuum that is quiet, then you may want to find a different one. People have mentioned that it is one of the noisiest vacuums that they have owned. If you’re tired of having a bulky vacuum cleaner that is a pain to get out when you need to clean up a small mess, then the Dirt Devil Accucharge 15.6V Cordless Bagless Stick Vacuum, BD20035RED could be a good option for you. It stores easily with its compact design that breaks down to fit in even the smallest closets. It only takes about 6 hours to fully charge, and when used properly, the battery will last a lot longer than many other cordless vacuums. If you have hard floors and carpet or area rugs throughout your house, then this will be a handy vacuum for you to order from Amazon since it is suitable for just about any surface. Dirt Devil is a household name in the floor care industry. They manufacture inexpensive vacuum cleaners as well as larger and more expensive vacuum cleaners, so they are suitable for everyone’s budget. The company began about 110 years ago and is still considered to be one of the best in the business. Not only do they make products for residential customers, but they are also a big name in the commercial ranks as well. Dirt Devil is one of the first names that people think about when they think of vacuum cleaners.